Coming from the south you know when you have arrived in Thaton as the hill line ahead curves around to the right marking the top end of Thailand and creating a natural barrier with Burma beyond. 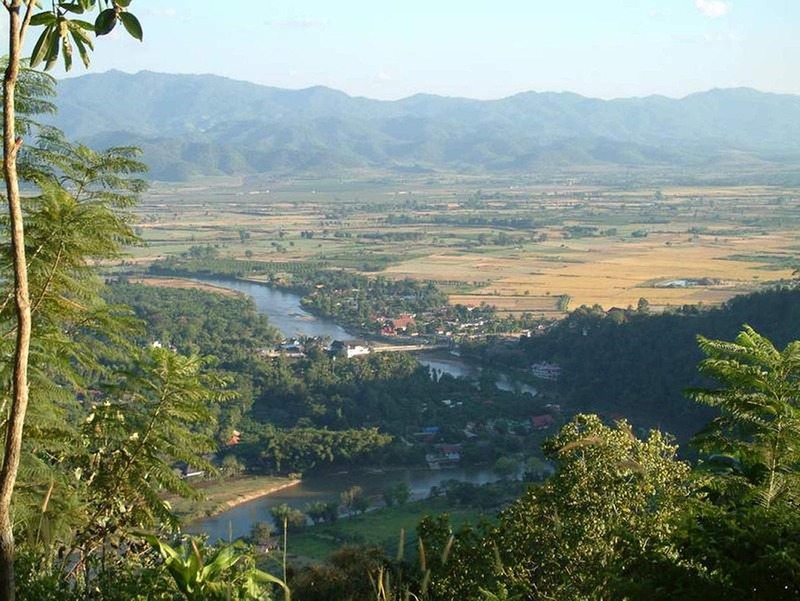 Thaton straddles the Kok River which rises in Burma and spills into the Fang valley in an easterly direction on its way to join the Mekong. To the west the town nestles into this hilly little corner of Thailand, an attractive setting to enjoy this fascinating area of cultural diversity and rich history. Thaton has been a known settlement for almost a millennium and its famous Wat (temple) is said to date from these earliest times. 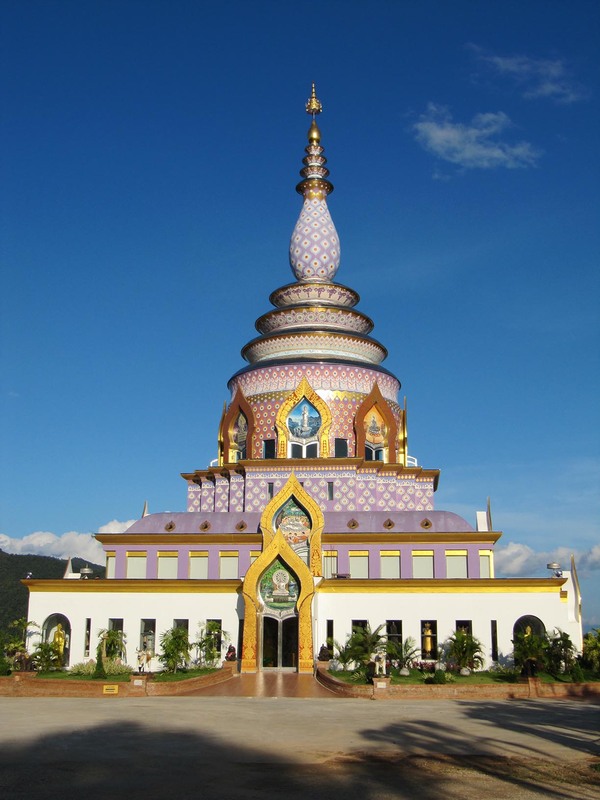 Comprising nine levels working up the hillside to the west of the bridge, Wat Thaton is a visitor’s ‘must see’ with its range of styles of temple complexes, including the Chedi Gaeow (The Crystal Chedi). The collection of Buddha images from various Asian countries is second to none, and a Buddha relic takes pride of place at the top of this extraordinary building. 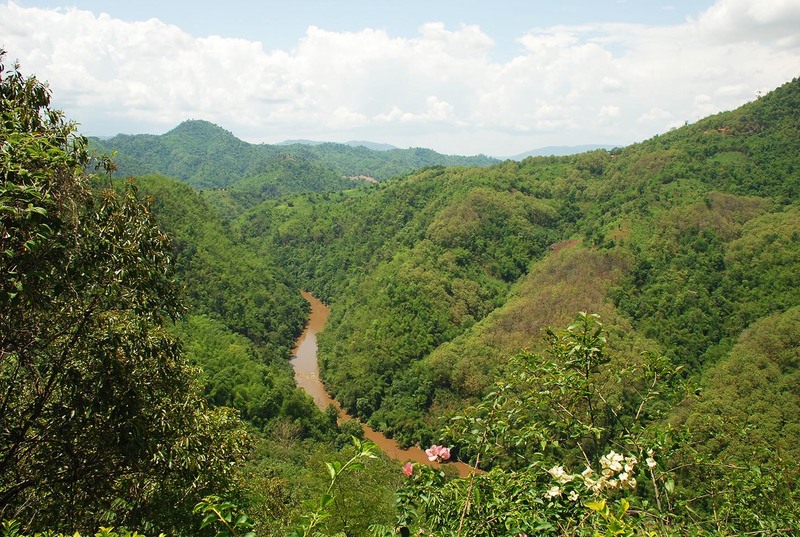 There are panoramic views across the plain to the Chiang Dao hills in the south, the Wa Wee hills to the east and glimpses of Burma through the hills looking westerly. It is a walk worth taking from first level right up to the impressive standing Buddha keeping a serene watch over the valley. The platform again affords expansive views down on to the village and the valley floor beyond. 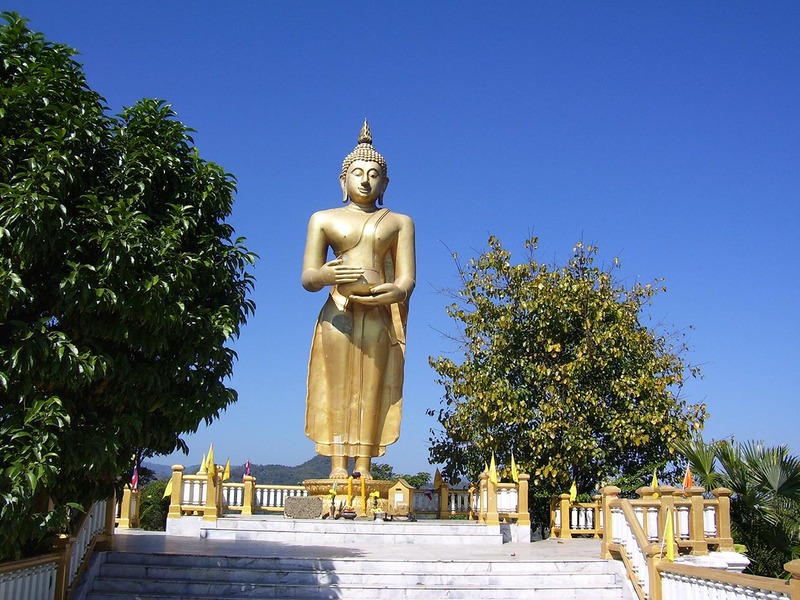 To the rear of the golden Buddha complex are views of the steep sided gorge and you are looking directly into Burma. The famed and revered King Mengrai and his army tramped and camped through the area battling with other feudal chieftains in the late 13th century gradually winning ascendancy and uniting the Lanna (land of a million rice fields) kingdom, the beginnings of what would become modern Thailand. It is highly likely that Mengrai and his army crossed the Mae Kok in Thaton, as it is thought that he built a simple palace here. Other armies have continued to pass this way in 20th century history – beleaguered regiments of Gen Chiang Kai Shek’s Kuomintang army found refuge in these parts having fled Mao’s China (after the civil war ) and later being pushed out of Burma. Being border country the area has become home to different ethnic groups. As well as the KMT, originally from Yunnan province, the Chin Haw traders a century before passed through the region and many settled here in Thaton and in the villages along the river’s course. Look out for Chinese graves traditionally set on high ground along the road out of Thaton to Chiang Rai and other architectural styles and motifs typical of old China. The Shan people are also clearly present in the Thaton area. Indeed the far side of the river was once part of the Shan state until about a century ago, when the border was moved back to the ridgeline. There are two Shan villages up to the left after you cross the bridge. Gaeng Sai Moong which is home to Thai Lue Shan and Ban Rom Thai (meaning ‘under the umbrella of Thailand’) which is a larger village of Tai Yai Shan. 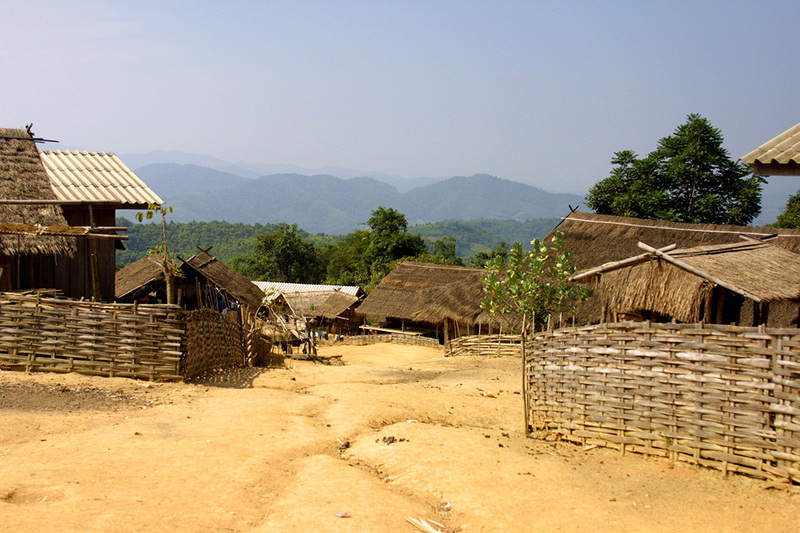 A number of Lahu villages are scattered in the hills around Tha Ton and the short trek from above Wat Thaton to the Lahu village of Gaeng Tum, with views into Burma, is worth the effort. 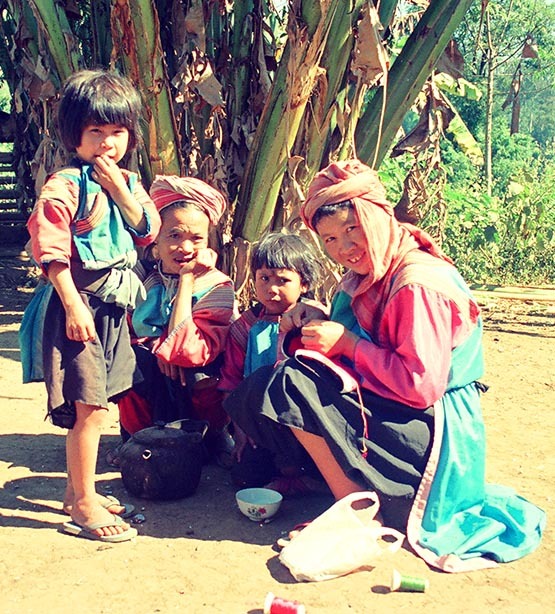 Along the Chiang Rai road Akha and Lisu villages can be explored. On market days, (Monday mornings in Thaton)the different hill tribe groups intermingle with the Tai Yai and local Thai buying and selling. 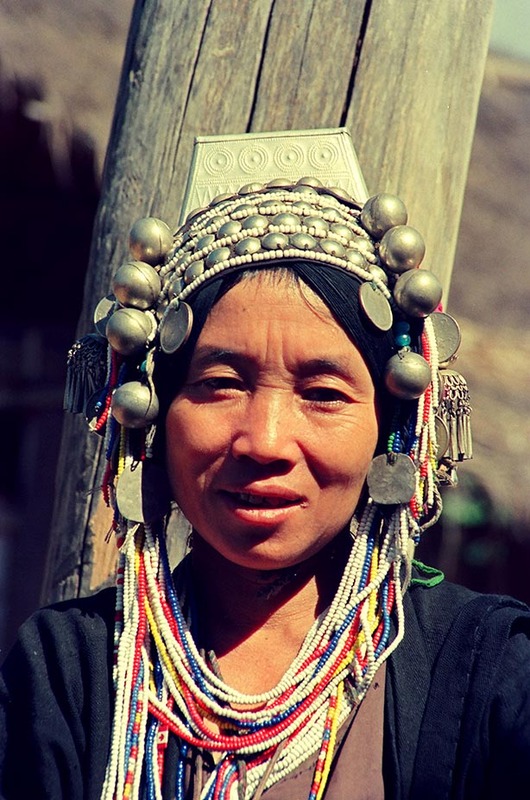 The Lahu rather merge with local Thai wearing sarongs or more Western style dress, but the Lisu in their colourful velveteen pinafore dresses and Akha with their distinctive headdresses are easily spotted. For a good walk not involving a climb, take one of the lanes leading into the valley and follow the network of tracks. See the farmers at work planting or harvesting much as they have been for hundreds of years, this also makes a good cycle ride. It is an extensive area but keeping an eye on the White Buddha as a landmark and you can’t get lost! Weather-wise Tha Ton is best visited between late October and early March when the morning and evenings are cooler and the views from higher points can be crystal clear. The days can still be hot but there is plenty of respite and shelter from the heat. Dazzling night skies and early morning mists across the river add to the charm of the cooler months. 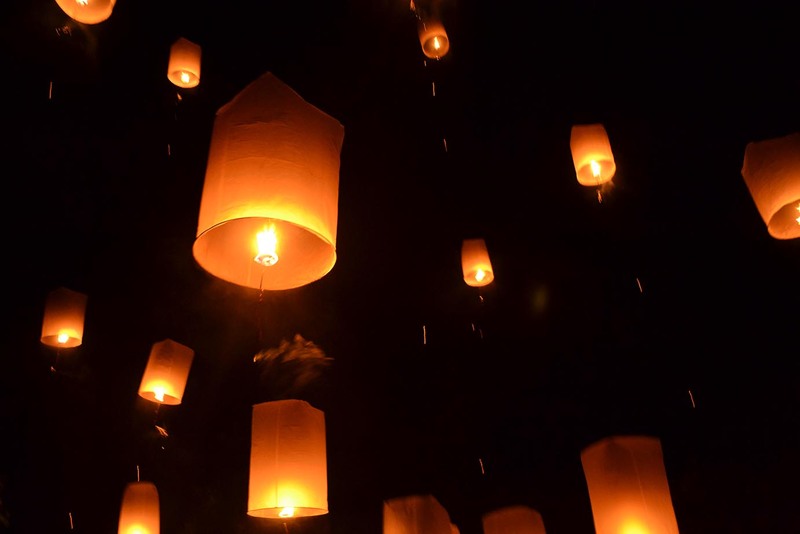 If visiting in late November the Loy Kratong festival is a ‘must’ to experience in rural areas as is the infamous Songkhran festival in mid-April, with its mayhem of water throwing… a far cry from its gentler origins of sprinkling water as a blessing! Further afield there are numerous other places of interest which are all reached within a day’s trip. 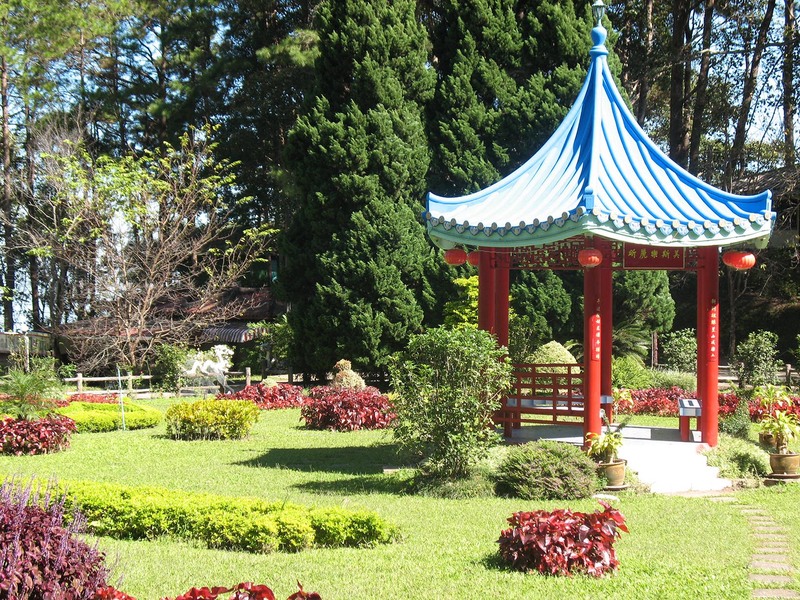 These include the Golden Triangle, the gardens and agricultural projects of Doi Tung and Doi Ankhang, visits to Chinese and Shan settlements, various hilltribe villages. Details of these can be found on the tours pages. Although there are plenty of more formal tourist attractions, just being in a largely unspoiled part of Thailand, and seeing the daily life of its people, is an experience in itself and in many ways, just as memorable. It is not an exaggeration to say that Thaton and the Maekok River Village Resort is a destination in its own right.